Inspired by the powerful engine of world's top-class racing cars, the SMOK E-Priv has a cool and fashionable appearance with 230W max output. Consisting of the E-PRIV TC MOD and TFV12 Prince tank, the SMOK E-Priv Kit is definitely an excellent device. 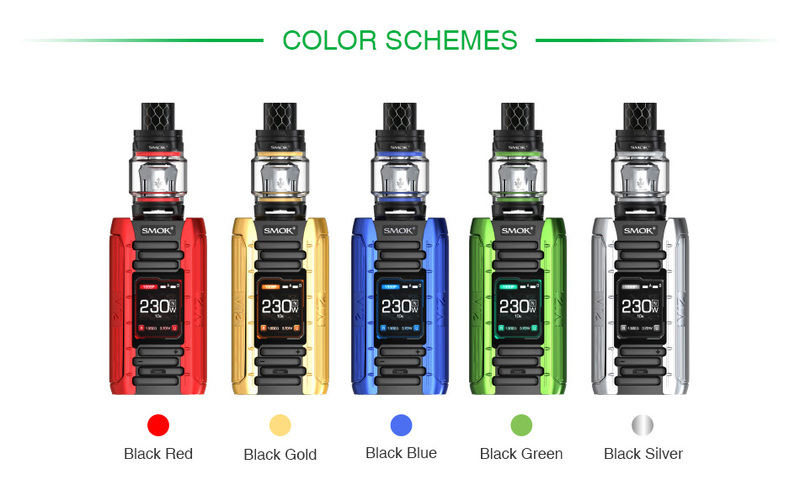 As a new member of the SMOK family, the SMOK E-Priv is a cool and fashionable TC Kit with unique engine-like appearance, consisting of the SMOK E-Priv TC Box MOD and the TFV12 Prince Tank. Powered by dual 18650 batteries, the E-Priv can fire up to the max output of 230W with various working modes including VW/TC mode or MEMORY mode. Together with a centered 1.45-inch TFT screen and the large fire key, you can easily operate the E-priv. And the TFV12 Prince Tank features 8ml large e-juice capacity with new powerful V12 Prince dual mesh coils, which brings unprecedented heating area and heating speed. The TFV12 Prince Tank also includes an anti-slip ring to protect the glass tube against damage or breakage, which is also taken as an ornamental part for the tank. No hesitation, just get the SMOK E-Priv Kit now! 3 months for E-Priv MOD.